…it has the savor of analogical probability. In good time, Flask’s saying proved true. As before, the Pequod steeply leaned over towards the sperm whale’s head, now, by the counterpoise of both heads, she regained her even keel; though sorely strained, you may well believe. So, when on one side you hoist in Locke’s head, you go over that way; but now, on the other side, hoist in Kant’s and you come back again; but in very poor plight. Thus, some minds for ever keep trimming boat. Oh, ye foolish! throw all these thunder-heads overboard, and then you will float light and right. Far back on the side of the head, and low down, near the angle of either whale’s jaw, if you narrowly search, you will at last see a lashless eye, which you would fancy to be a young colt’s eye; so out of all proportion is it to the magnitude of the head. Now, from this peculiar sideway position of the whale’s eyes, it is plain that he can never see an object which is exactly ahead, no more than he can one exactly astern. 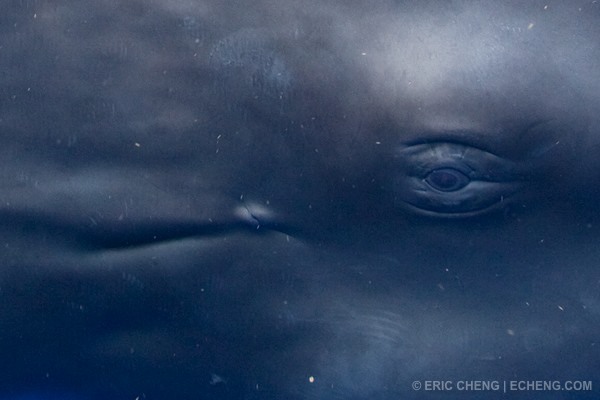 in a word, the position of the whale’s eyes corresponds to that of a man’s ears; and you may fancy, for yourself, how it would fare with you, did you sideways survey objects through your ears. You would find that you could only command some thirty degrees of vision in advance of the straight side-line of sight; and about thirty more behind it. If your bitterest foe were walking straight towards you, with dagger uplifted in broad day, you would not be able to see him, any more than if he were stealing upon you from behind. In a word, you would have two backs, so to speak; but, at the same time, also, two fronts (side fronts): for what is it that makes the front of a man – what, indeed, but his eyes? A curious and most puzzling question might be started concerning this visual matter as touching the Leviathan. But I must be content with a hint. so long as a man’s eyes are open in the light, the act of seeing is involuntary; that is, he cannot then help mechanically seeing whatever objects are before him. Nevertheless, any one’s experience will teach him, that though he can take in an undiscriminating sweep of things at one glance, it is quite impossible for him, attentively, and completely, to examine any two things – however large or however small – at one and the same instant of time; never mind if they lie side by side and touch each other. But if you now come to separate these two objects, and surround each by a circle of profound darkness; then, in order to see one of them, in such a manner as to bring your mind to bear on it, the other will be utterly excluded from your contemporary consciousness. How is it, then, with the whale? True, both his eyes, in themselves, must simultaneously act; but is his brain so much more comprehensive, combining, and subtle than man’s, that he can at the same moment of time attentively examine two distinct prospects, one on one side of him, and the other in an exactly opposite direction? If he can, then is it as marvellous a thing in him, as if a man were able simultaneously to go through the demonstrations of two distinct problems in Euclid. Nor, strictly investigated, is there any incongruity in this comparison. Is it not curious, that so vast a being as the whale should see the world through so small an eye, and hear the thunder through an ear which is smaller than a hare’s? But if his eyes were broad as the lens of Herschel’s great telescope; and his ears capacious as the porches of cathedrals; would that make him any longer of sight, or sharper of hearing? Not at all. - Why then do you try to “enlarge” your mind? Subtilize it.